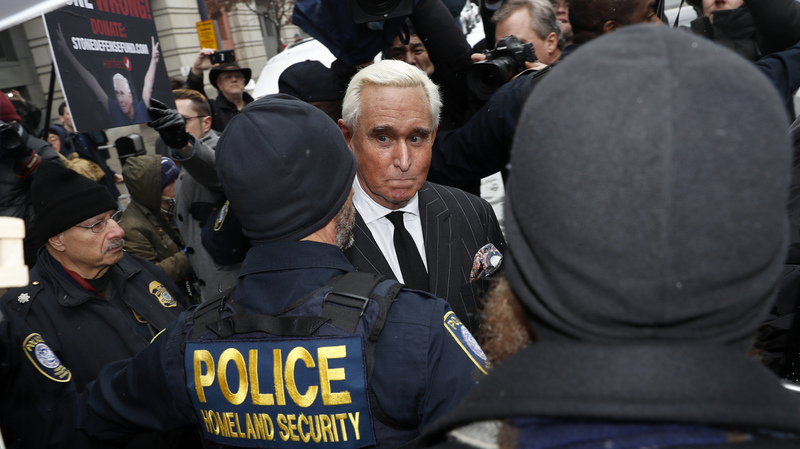 Federal Judge Imposes Gag Order In Roger Stone Case Judge Amy Berman Jackson said that lawyers and others in the case must refrain from statements that risk creating "material prejudice" but neither they nor Stone must keep completely silent. Roger Stone leaves federal court on Feb. 1. The judge in his case has imposed a gag order on attorneys and others. Jackson wrote in her order she has responsibilities to protect the ability to seat an impartial jury and "maintain the dignity and seriousness of the courthouse and these proceedings." Lawyers, witnesses and Stone aren't forbidden to make all public statements. Stone is facing seven criminal counts including obstruction of an official proceeding, witness tampering and making false statements. Prosecutors say he lied to Congress about the role he may have played in the 2016 election as a conduit between Donald Trump's presidential campaign and WikiLeaks, which released embarrassing material stolen by Russian intelligence officers. Stone has pleaded not guilty and says he did nothing wrong. All he did in 2016, he has argued, was hype public information that was available to everyone else at the time. Stone had opposed a gag order. As someone who makes much of his living as a commentator and by making media appearances, he said he feared being required to keep silent. Jackson tried to reassure him in an earlier hearing that even if she did impose a gag order, he would still be at liberty to talk publicly about immigration and foreign relations and even New England Patriots quarterback Tom Brady if he wants. Stone and his supporters have spared no criticism of the Justice Department. Stone complained that he was treated worse than Osama bin Laden, and he and supporters have questioned how CNN was able to position cameras to capture the FBI's arrival at his Florida home last month. The cable network has explained that its journalists noticed grand jury activity in Washington that led editors and producers to guess that an indictment might be coming. Law enforcement specialists also have said that a large number of officers arriving early in the morning to serve a warrant is standard procedure. Jackson's order didn't stop Stone's criticism on Friday; he said in an email to supporters that authorities are trying to hurt him by denying him the ability to raise money for his legal defense fund and that he is so low on cash he is "literally living on peanut butter and jelly sandwiches." Jackson, however, did write in her order that she would be watching the public comments that Stone makes. Wrote the judge: "While it is not up to the court to advise the defendant as to whether a succession of public statements would be in his best interest at this time, it notes that one factor that will be considered in the evaluation of any future request for relief based on pretrial publicity will be the extent to which the publicity was engendered by the defendant himself."